The external shells, made of composite fibers (glass, carbon and Kevlar® fibers), are produced through a scrupulous process. The material used for the external shells is made through the alternate stratification of composite fibers (glass, carbon and Kevlar® fibers) polymerized through a compression process in a safe and controlled environment. The use of these innovative composite materials and the choice of this method of production make this helmet a product of high quality, characterized by remarkable lightness and strength. 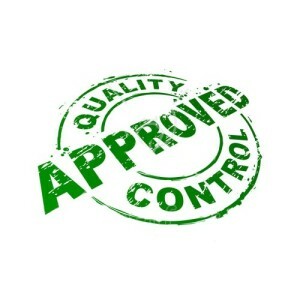 In the process are used certified and approved high quality resins. 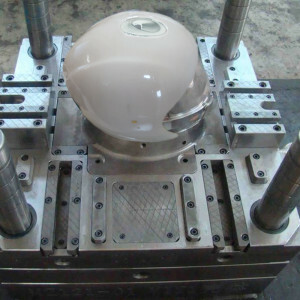 The external shells, made of thermoplastic, are produced through an articulated melting process in which a set of polymers of polycarbonate is then injected in special molds.The inner shells are made of polystyrene obtained through a steam molding process at high temperatures. The visors are molded and treated with a vigorous anti-scratch process. The external shells are coated and treated with UV filter in order to guarantee a high quality product. Because HMR Helmets is always careful to protect the environment, during the finishing processes the company chooses to use water based paints. The decals, entirely applied by hand, give to the helmets of HMR Helmets® a fierce and recognizable design. The liners are made with innovative materials, which provide maximum breathability and comfort. The seams, made by expert hands, ensure optimum comfort and fit. The final product is well characterized by high quality and attention to detail, which is typical of ‘handmade in Italy’ products. Along the mounting lines, it takes place the accurate assembly of the various parts that composes each helmet of HMR Helmet®. Before and during this process, which is entirely executed by hand by specialists, each component is meticulously checked and eventually discarded if it contains even the slightest imperfection. During the various stages of production, both material and components are subjected to quality tests. For example, the tests verify the technical specifications of the materials; optical tests are performed on the visors; and it is analyzed for quality and resistance of the coating. Because we strongly believe in our helmets and our production system, we give to all our importers and dealers the opportunity to visit our company in order to let them see firsthand the work applied to our products. Before packaging the helmets, we personally analyze the product and affix the approval of quality. The external shell is the first defense against external shocks. 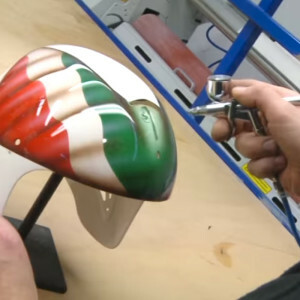 It spreads the energy of the impact and it concentrates it in a single point on the entire helmet, protecting both the head and the other components of the helmet. The core has the function to absorb the energy of an impact, which it does through compression or destruction, in order to protect the head. 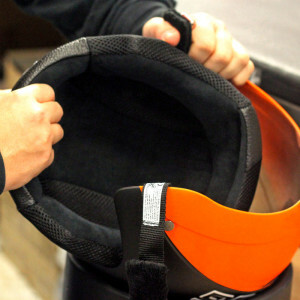 The core is made with expanded polystyrene, the perfect material for a light weighted and shock absorbing helmet. The padding is made of microfiber fabric with Microsense technology, which guarantee high comfort and softness. The addition of the hydrophilic treatment ‘2dry’ ensures a fast perspiration dispersion and a quick drying. The padding is also sanitized trough an antimicrobial process, which protects against bacteria and fungus. The subsequent drilling of the Shalimar and the use of reticulated foams make the padding highly breathable. A fundamental feature for the comfort of the skier is the ventilation system, which allows the entry of fresh air and the simultaneous exit of the hot air and moisture. Our R&S Team studied the quantity of air flow inside the helmet, in order to create new solution to guarantee the right amount of air even in extreme conditions as the one of high altitude. The soft cheeks and the ear pads are made of thermoformed material and faux leather. In some cases, the openings are protected by nets, in order to allow the proper perception of the external noise. They are removable for maximum thermal comfort even in the hottest periods. The function of the fastening system is both to hold the helmet firmly on your head, and to make sure the helmet stays on your head in case of a crash. On our helmets we use a strap with a metal buckle and with a micrometric regulation with fast release. The visor must be a protection against the wind and snow, ensuring an optimal vision without fogging. Our visors are made of polycarbonate, and are treated with an anti-scratch process. Quick release mechanism for easy removal when not in use. On the front of all the helmets, a protection made with a soft material has been added in order to avoid leaks of water between the helmet and the integrated mask in case of rain or melted snow. The system uses the patented SFR technology (Solid Fragrance Release) by Oikos Fragrances. Unlike most common conventional systems, the spread of the fragrance takes place in a completely natural and non-invasive way, without the use of solvents or other potentially aggressive elements. Search and find the dealer nearest you.